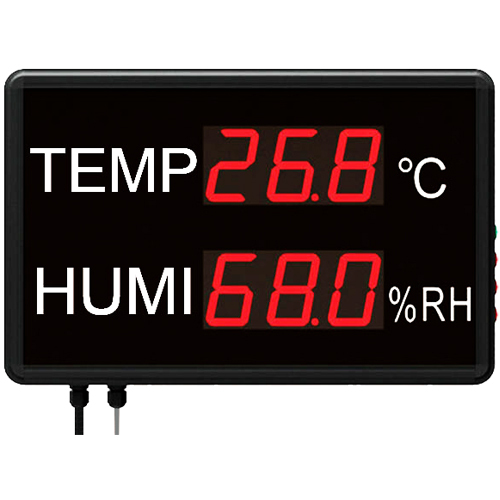 STR823 large display temperature humidity is ideal for areas where the temperature and humidity of the environment need to be clearly visible. The bright LED is visible in dimly lit areas and can be seen from a distance of up to 30 meters, with a viewing angle of 90º. The instrument has an external temperature and humidity sensor on a 1.5 meters extension lead (with wall-mounting bracket), and can be set to have a high and low limit for both temperature and humidity readings. An in-built audible alarm (beep) can be easily enabled and will sound if these limits are exceeded. An offset function on the display enables values to be corrected when calibrated. Buttons on the side allow the following features to be set: alarm on/off, alarm high/low thresholds and offset. Commonly used in workshops, laboratories, pharmaceutical storage and production line areas, interrogation room and waiting room etc.